The Altitude Women's Motorcycle Pant is the perfect pair of trousers for year-round riding. 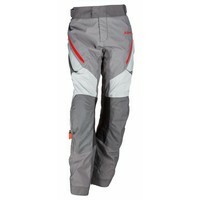 The 4-season pant is particularly suitable for touring and all-road bikes with a fairly straight sitting position. The Altitude is 100% designed for women, resulting in comfortable and stylish trousers. The Altitude motorcycle pant is equipped with three-layer Gore-Tex, the highest level of wind and waterproofing and still breathable. The ventilation ports on the front and rear of the thighs provide cooling on hot days. The comfortable pant is reinforced with abrasion-resistant Cordura and reinforced with leather on the inside of the knees. The fit takes the female figure into account and can be adjusted with adjustment straps at the waist. 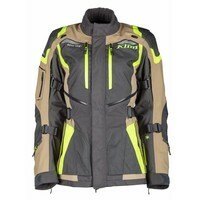 This slightly higher back provides protection against the elements and can be attached to any KLIM jacket with a universal zipper. 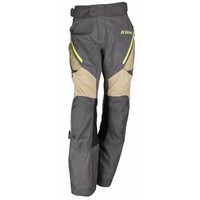 The trousers include high-quality D3O protectors, which are comfortable to ride and offer ultimate protection when needed. For improved visibility, the Altitude is equipped with 3M reflectors. The Altitude ladies pant is available in Black and Grey. 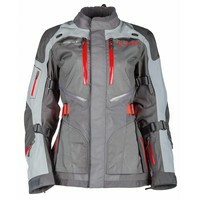 In addition, a matching Altitude Women's jacket is available in Black, Grey and Hi-Vis. The pants are offered in two size variations: Regular, and Tall. Use the KLIM Women's Size Chart to determine your size.